“Penthouse Blues” (PDF) from the Bennie Green album, Swings The Blues. Support trombone.alex via Patreon or Paypal. 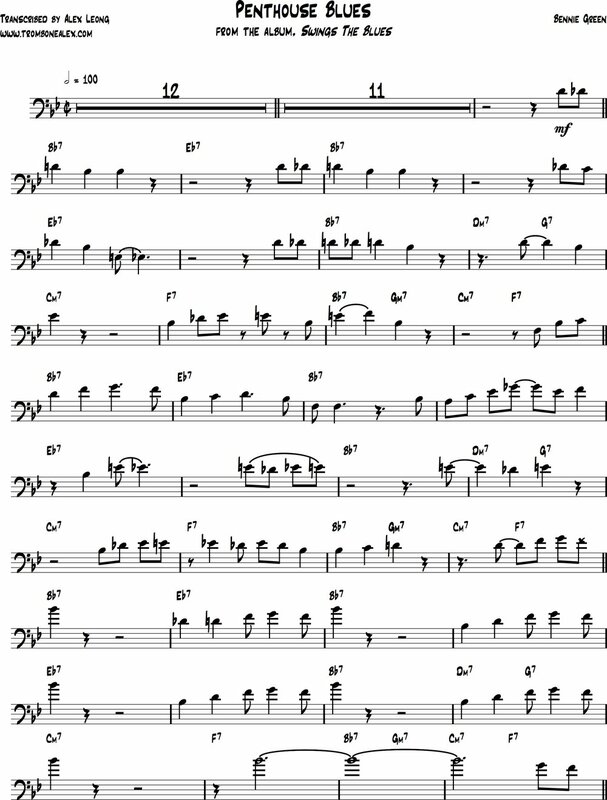 Not to be confused with Sonny Rollins’ “Pent Up House” or the Burton / Jason song “Penthouse Serenade,” Bennie Green’s composition lacks any identifying features to set itself apart from the crowd; there’s no significant melody, it’s a straight-ahead Bb blues, and no virtuosic performance by any individual. Yet, this recording of “Penthouse Blues” captures a small group dynamic that one would expect to hear from a big band. Green casually leads his group through “Penthouse Blues” almost as if it were a warm-up tune. His trombone solo simply riffs on ideas to imply the blues; the shifting major-minor quality, melodic tension through arpeggios and chord extensions, and a slight use of chromaticism within the blues scale. Without question, Bennie Green could hang with his bebop contemporary, J.J. Johnson, but it’s his use of the big band shout tradition that breathes life into his rhythm section and this performance.